Want to create 3D art for free? Here’s how! MORE INFORMATION ABOUT THE SOFTWARE: DAZ Studio Pro – This 3D software package includes DAZ Studio Pro, a feature rich 3D figure customization, posing, and animation tool that enables anyone to create stunning digital illustrations and 3D animations. 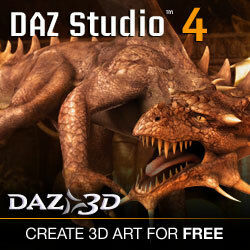 DAZ Studio Pro is the perfect tool to design unique digital art and 3D animations using virtual people, animals, props, vehicles, accessories, environments and more. Simply select your subject and/or setting, arrange accessories, setup lighting, and begin creating beautiful artwork. Bryce 7 Pro – Bryce is an award winning, fun, feature-packed 3D modeling and animation package designed to allow new users to quickly create and render stunning 3D environments. Bryce combines exceptional power with an innovative interface for incredible ease of use. Add wildlife, people, props and more to your scenes via the DAZ Studio character plug-in in addition to terrain, water, sky, rocks, clouds, fog, vegetation, and architecture for which Bryce has long been the standard. Originally created by Eric Wenger, Kai Krause and Phil Clevenger. Hexagon 2.5 – Hexagon delivers all the tools a graphic artist needs to create detailed 3D models ready for final render. Packed with features such as DAZ Studio Bridge, sculpted primitives, freehand modeling brushes, micro-displacement modeling tools, comprehensive UV-mapping modules, advanced 3D paint, and instant ambient occlusion. Hexagon provides you with all the options of expensive competitor software, but at an affordable price. This offer only lasts through the end of February, so take advantage of this $800 savings while you still can! I know I am. *Don’t see our link to the free software? You may need to turn off ad-blocker or add our site to a list of “safe sites” and enable cookies for the link to work. We promise to only link to reputable companies and pre-screen all advertisers on our website.